Wall Street is already betting that next week's earnings at the nation's biggest banks will be dismal. What remains to be seen is just how bad they will be. Hundreds of billions of asset-backed paper has had to be disposed of. Yet so far the losses of banks that have already reported this quarter are less than $20 billion. Could they have gotten off so easily? The preponderance of evidence shows that much of the paper, which includes subprime mortgages, auto loans and credit card debt has not yet found buyers. There is a day of reckoning in their future. The reasons? First, the demand for asset-backed commercial paper is still shrinking . According to MarketWatch, “W hile asset-backed paper is still shrinking, the slower pace of decline indicates that the market has now purged most of the securities that it no longer trusts. By some estimates, $300 billion in mortgage-backed paper was outstanding when the crisis began.” This statement is called into question by the Federal Reserve's Maturity Distribution of Commercial Paper . Their figures show $107.3 billion of last week's maturing asset-backed securities were rolled forward into this week, making a total of $221 billion that needed to be disposed of this week. This suggests that there may still be problems transitioning out of these leveraged loans. What is the decennial pattern? Cycle watchers have been pointing out that the month of October in years ending in 7 is especially volatile. Peter Eliades, of Stock Market Cycles has commented that, since 1897, “The average post June 20th -June 21st decline within the “7” year was a very substantial 21.4%.” There is pattern repetition that suggests the possibility of a large magnitude decline this time around. The cyclical pattern for 1932-37, 1982-87 and 2002-07 have similar time patterns that suggest similar outcomes. The decline in 1937 lasted from August 14 th to November 24 th when the Dow declined 40.2% on a closing basis. The Decline in 1987 started on August 27 th and lasted through October 20 th with a loss of 38.2%. 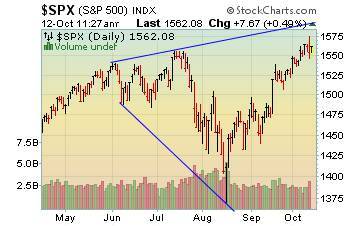 The pattern also implies heightened volatility through the first quarter of 2008. Where's the good news? Like a phoenix rising from the ashes, the “8” year of the decennial pattern is one of the most consistent gainers of the decennial pattern. From the low in the first quarter to the end of the year, the average gain since 1878 has been 31%. Something to look forward to, but a sobering analysis of what might happen before the good news. …with a final rally and is ready for the next phase of the bear market. Last night's decline may be the warning of more to come as earning reports start in earnest next week. 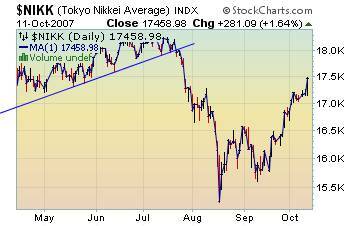 The good news about the Bank of Japans' credit rating may be offset by news of declining earnings on the Nikkei. The Shanghai Composite hit a new all-time high yesterday as investors chose steel manufacturers as the “flavor of the day.” The frantic search for the next big thing is leaving investors darting from one sector to another, trying to mine the last penny (or yuan) of profits. market observations will follow next week. Last night's trading was marginally down as traders anticipate another rate hike by the Bank of China. Ready for a megaphone blast? Will the downtrend in bonds strengthen? The U.S. Treasury Bond Index paused this week at a critical support level. 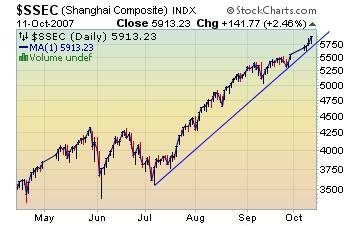 Further weakness here could lead to a much larger decline. For most of us, this means higher interest rates ahead for mortgages and long-term loans. The latest jobless claims and import prices reports backed the view that inflation concerns will keep the Federal Reserve from reducing interest rates later this month. Moreover, the Treasury market is doubly leery of inflation because it also eats into fixed-income investments. The subprime problem is more widespread than you think. The media loves to put a face on the subprime borrower as an urban low income borrower just trying to live the American dream, was the victim of an unscrupulous borrower, good people facing a few economic shocks, didn't realize how high their payment would be when their ARM reset, and so on. A recent Wall Street Journal study illustrates how subprime loans crossed all socioeconomic levels, geographic regions, and ethnic lines. In fact, there were even high concentrations of subprime loans in affluent areas with high housing appreciation rates; areas that now lead the nation in foreclosures. The greenback is at a critical point. Reports today show the dollar rising again vs the other major currencies. Traders are cutting their bets that the Fed will reduce interest rates again soon. Economists are still viewing the dollar in a longer-term weakening mode, but the technical indicators say that something else may be going on. 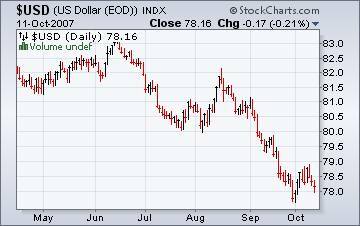 If the dollar can advance beyond 79 in the next week or so, we may see surprising strength to the upside. 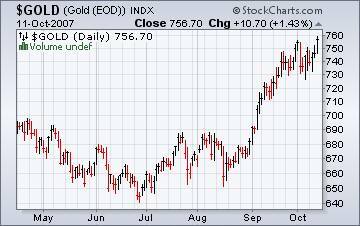 Will gold reach $1000 an ounce? The principles of Contrarian Investing hold that when the vast majority of people agree on anything, they are generally wrong. Otherwise no market would function because there is simply no minority with money enough to make a majority rich. A true contrarian, therefore, will first try to determine what the majority are doing and then will act in the opposite direction. Midwest benefiting from lower gasoline prices. 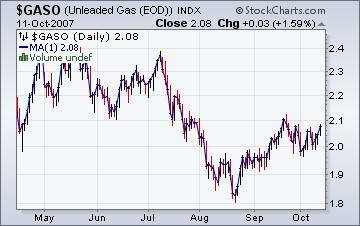 Recent increases in wholesale prices for crude oil are expected to spell higher gasoline prices. And gasoline supply is tightening, as refineries shut down some capacity to make seasonal changes aimed at ensuring they'll have enough heating oil in the winter months ahead. 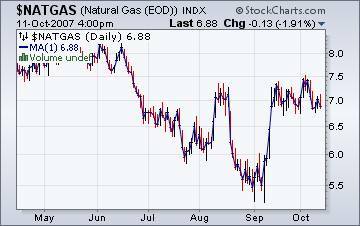 Natural gas supplies are in good shape. Moderate temperatures, ample supplies of natural gas in storage, and the imminent end of the 2007 hurricane season likely contributed to the declines (in the last week or two). However, industrial demand for natural gas, lingering injection demand for natural gas, and incipient heating demand for natural gas in the upper Midwest provided some support for prices, preventing larger declines., says the Energy Information Agency . The good news is that the Midwest will probably see lower gas prices , even if temperatures are lower than normal this winter. Tim Wood of www.cyclesman.com , John Grant and I have had a running commentary on the markets again this week. You may listen to our comments by clicking here . Please make an appointment to discuss our investment strategies by calling Claire or Tony at (517) 699-1554, ext 10 or 11. Or e-mail us at tpi@thepracticalinvestor.com . Disclaimer: It is not possible to invest directly into any index. The use of web-linked articles is meant to be informational in nature. It is not intended as an endorsement of their content and does not necessarily reflect the opinion of Anthony M. Cherniawski or The Practical Investor, LLC.